crashing down in 2002 when I was diagnosed with a pericardial effusion (fluid and inflammation around my heart). After major surgery and the diagnosis I had to accept a “new” normal…a “new” me. This is not easy because the medications that kept me alive also ruined my life. I lost everything I knew as normal. I lost my husband, my friends, my ability to do anything…anything at all. I lost my ability to parent properly. I lost my life as I knew it forever. 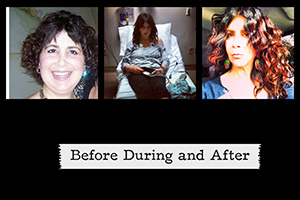 The only thing I actually gained, was 60 pounds from the prednisone…which kept me alive. I use the term “alive” loosely because it was more like existing as a zombie. So 10 years passed and I started practicing yoga again, in an amazing studio, which in a very Karmic, way began with mine. So when I saw Diego again he pulled me aside (for real, pulled) and told me about “Functional Medicine”. I listened and acted because I saw in his eyes such care, honesty and a little worry! I listened and I acted and I met at Holistic Specialists, Shantih Coro which would then become “my” healer. I am in remission now, no more medications. They healed me…but I healed me as well. I made a HUGE change and did everything they told me to do… everything. Laboratory analysis, Ginger, Ghee, turmeric, bone marrow, many supplements, raw dairy, chicken soup, etc… I am in remission and that speaks for itself. Please look at this picture it says “a thousand words”.